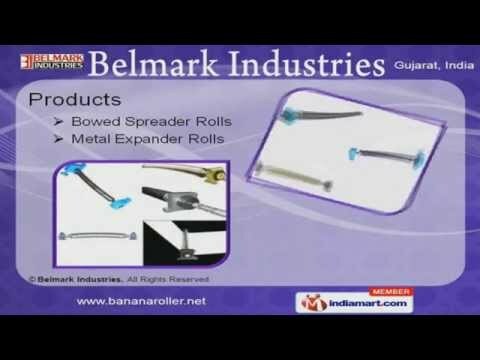 Welcome to Bel Mark Industries. Manufacturer of Bow, Spreader, Poly band Expander Roll Products The company was established in 1995 at Ahmedabad. Our Technically sound infrastructure & High grade raw material are catering to clientele across Textiles, Paper & Plastic industries across global markets. Maximum client satisfaction, Ethical business policy & expert manpower are some of the factors that make us the first choice of our clients. We are engaged in offering wide array of Bowed Spreaders & Metal Expander Rolls. Our wide spectrum of product includes Curve Bar Expander & Slat Expander Rolls that are a class apart. Along with that we offer Scroll Rolls & Polyband Expanders that are available at affordable prices. Our Rubber Grooved Spreader, Cooling Roll & Banana Rollers are known for their easy installation. We also provide Metallic & Rubber Bow Rolls that are fabricated with best grade raw material. Jointed Axle Rubber Bow Roll & Aluminum Slat Expanders are some of our best selling product in market.